Many people consider the squat to be king of the exercises. They work your entire lower body better than any other exercise and help you build an iron core whilst you’re doing so. A strong set of legs can be vital in MMA and BJJ, particularly when shooting for doubles and singles and trying to prevent you yourself from being thrown to the mat. Squats are the quickest and most effective way to get those strong set of legs. 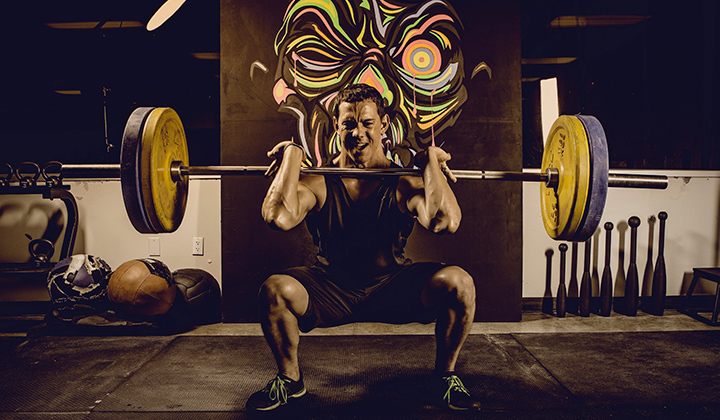 Squats are relatively simple; load up a barbell, rest it along your back/shoulders and squat down to the ground. Stand back up again and you have just completed one rep.
As your legs are some of the largest muscles on your entire body you’ll need quite significant amounts of weight in order to see and feel progress. Which means that to load the bar onto your back, you’ll need some specific apparatus to get it there. When you’re squatting 200 kilos, good luck trying to get that on your back without a squat rack. In weight-training, squats are mandatory which means that using a squat rack is mandatory by proxy. Unfortunately, there are a surprising amounts of gyms out that don’t even have squat rack, or they just have one and there’s always some idiot using it to do his barbell curls, and always doing so with terrible form. With your own squat rack at home, you’ll never have to wait for someone to finish or watch them do cheat curls in the rack from across the room. You’ll be able to squat to your hearts content whenever you so desire. You can choose from two different options with this product from CAP Barbell; just the standalone squat rack or their exercise bundle that comes complete with a bench and a barbell. With the exercise bundle you’ll be able to squat and do exercise such as bench presses. The bench itself is not attached to the squat rack so it can be moved around or even stored away when not in use. The bar at the top of the squat rack can be used for pull-ups and chin-ups and can even be used to attach resistance bands, TRX set-ups, etc. This exercise stand is more than just a squat rack. It’s extremely handy to be able to do a wide-variety of exercises and workouts within only the one station. Every fitness conscious person would have a squat rack in their home if they could. The only real hindrance is the space or lack thereof. If you’re one such person who would absolutely love to have their very own squat rack, that they could use whenever they wished, but don’t really have the space, then you’re in luck. This adjustable rack from Yaheetech features what is essentially two individual racks that you set up next to each other in order for them to support your barbell. They work just as well as the full size, more permanent racks but have the advantage of being smaller, more compact and far easier to hide away when you’re not using it. They can be adjusted up to heights of 177cm and can support loads of 220kg, which is more than enough for most people. Some people get nervous when squatting due to safety concerns. Some people are scared that they’re gonna drop the weights and the bar will go flying; causing pain and destruction wherever it lands. Add in some seriously heavy weight and you can understand their fears. If you’re one of those people who are extra concerned with safety and security, it might be worth investing in a power cage, rather than just the basic squat rack. With the cage, you can squat inside it so that the rack is there to prevent the weight from falling backwards or forwards. It’s unlikely that the weight will slip, but it’s great to have those extra assurances in place so you know that you’ll be fine no matter what. I’ve already specified above some of the safety features of using a power rack cage rather than just the rack but another good thing about the cage is that they’re a lot more stable. The shape and weight of the cage spreads itself out so the cage itself is less likely to move or topple over. Again, this is extremely unlikely to ever happen if you set the product up correctly, but it’s better to be safe than sorry. Depending on your home/gym size restrictions, this cage can be purchased in both a 6 foot tall model and a full size 7 foot tall. If you’ve got the space, it’s best to go with the larger model so you’ve got extra room to really get comfortable with those squats… if you can ever truly be comfortable whilst squatting, that is. Body Champ have done everything in their power to ensure that this rack system is as strong and safe as can be. They’ve used thick, tough steel and made sure that every joint is welded as well as possible. They are also floor anchors on the bottom of the frame so that you can bolt it to the floor. It is highly recommended that you do bolt all of the systems to the ground so that they don’t move or topple. This rack can accommodate both 6 foot bars and 7 foot bars without issue and features two pegs to hold olympic sized weight plates. These weight holding pegs also double as extra security as the added weight from the plates makes the entire system more secure. Whilst squats are a great exercise, there’s no denying that they’re tough to do and easy not to do. It’s easy to walk into a gym on leg day, see someone already in the only squat rack and use that as an excuse to skip out on squats altogether. But not if you have your own squat rack. You’re far more likely to actually follow through and squat every single week if you have your own rack. And when you squat often and consistently, you get to enjoy all that extra size, strength and power that you may have been missing out on.